780-656-8585 See website for store hours. LLOYDMINSTER BORDER CITY FARMERS MARKET Servus Sports Centre, 5202 - 12 St. Thurs 12-6pm year-round. Sat 11-5pm winter only. Christmas Markets: Dec. 1 & 8. See ad page 91. Ross Creek Market Rg Rd 192 and Hwy 16. May-Sept weekends 10-6pm. Sherwood Park Farmers’ Market 401 Festival Lane. Wed. 4-8pm Jan 10 - Dec 19. Summer season at Festival Place parking lot, winter season in the Agora at the Community Centre. 780-464-3354. Sherwood Park Salisbury Greenhouse 52337 Rg Rd 232. Thurs. 4-7:30pm year-round. Sherwood Park Baseline Farmers’ Market #390 Home Depot parking lot. Wed. 4-8 pm May-Sept. 780-760-6807. Ukrainian Cultural Heritage Village Hwy 16. During Special Events: 10-5pm May-Sept. 780-662-3640 Vegreville Elks Hall, 5002 - 55 Ave. Fri 8:30-11:30am Mar 23-Dec 21. 780-632-2743. VEGREVILLE PYSANKA PARK MARKET See ad below. Vermilion Elks Hall 5018-49 Ave. Tues. 10-1pm. Mar 20-Dec 18.780-853-4669. EAST - HWY 15 & 45 ANDREW FARMERS' MARKET Andrew Arena 5013-51 Ave. Sat. 1-3pm April 14-Oct 6. 587-936-3203. 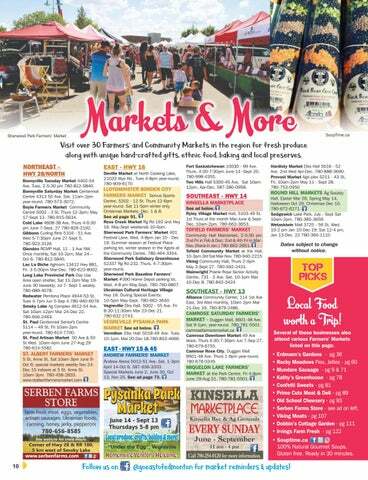 Special Markets June 2, June 30, Oct 13, Nov 25. See ad page 73. Fort Saskatchewan 10030 - 99 Ave. Thurs. 4:30-7:30pm June 14 -Sept 20. 780-998-4355. Two Hills Hall 5300-45 Ave. Sat 10am12pm, Apr-Dec. 587-280-0958. SOUTHEAST - HWY 14 KINSELLA MARKETPLACE See ad below. Ryley Village Market Hall, 5103-49 St. 1st Thurs of the month Mar-June & SeptDec. 10am-2pm. 780-663-3653. Local produce, crafts, baking & more! Alliance Community Center, 114 1st Ave East, 3rd Wed monthly, 10am-2pm Mar 21-Dec 19. 780-879-2486. CAMROSE SATURDAY FARMERS’ MARKET - Duggan Mall, 6601-48 Ave. Sat 9-1pm, year-round. 780-781-5501 camrosefarmersmarket.ca Camrose Downtown Market 49 Ave block. Thurs 4:30-7:30pm Jun 7-Sep 27. 780-679-6755. Camrose Rose City, Duggan Mall 6601-48 Ave. Thurs 1-6pm year-round. 780-678-0349. MIQUELON LAKE FARMERS’ MARKET at the Park Centre. Fri 4-8pm June 29-Aug 31. 780-781-5501. Call 780-254-0120 for more information. Several of these businesses also attend various Farmers’ Markets listed on this page. • Erdmann’s Gardens - pg 36 • Rocky Meadows Pies, Jellies - pg 60 • Mundare Sausage - pg 9 & 71 • Kathy’s Greenhouse - pg 78 • Confetti Sweets - pg 81 • Prime Cuts Meat & Deli - pg 89 • Old School Cheesery - pg 93 • Serben Farms Store - see ad on left. • Viking Meats - pg 107 • Dobbin’s Cottage Garden - pg 111 • Irvings Farm Fresh - pg 122 • Souptime.ca 100% Natural Gourmet Soups. Gluten free. Ready in 30 minutes. @goeastofedmonton for market reminders & updates!